I have been working on my final projects for school, and hope to have my rough draft submitted to my journalism class before the weekend. Saturday I will be quite busy. I have Christmas shopping, a family picture to take, pictures of Ciarra in her faux fur jacket I made her, and some cooking to do for the week. Right now I am just so burnt out. Today in my journalism class we were discussing the “art of seeing.” The discussion brought be to a memory of a painting my husband and I saw at the Los Angeles art museum. 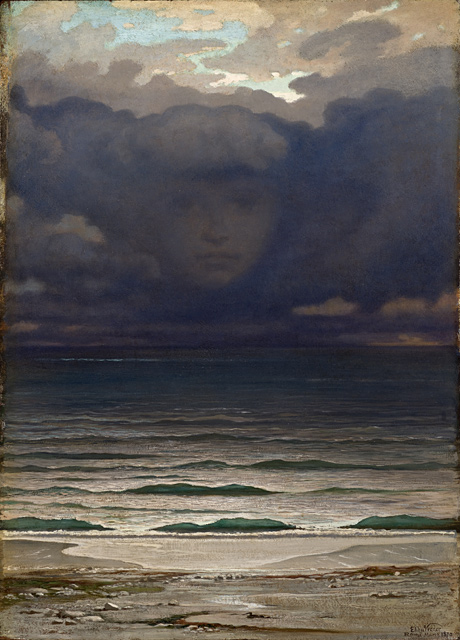 It is a painting by Elihu Vedder called Memory. I just have to share this painting with you. I asked both of my children what they felt upon looking at this work of art. It was interesting to hear their responses, both which were very different from each other. I would love to know what you think of this painting? What emotions do you experience while looking at it?? If you want to know more about Vedder’s painting, just click HERE. If you want to know more about the man himself then click HERE. There are a couple of link parties today on the Gingerly Made blog and the Made in a day blog. I was also wondering how many of you out there follow Fitness blogs?? If so, which do you follow?? I am looking for some good ones to check out. Any suggestions?? One that I really like is Kim Dolan Leto’s blog. Anyone else look at hers?? It is back to work for me. I will be stoked when this semester is behind me!! Just a few more days to go! Happy Fall Y’all! Fall Feast fun! My first thoughts were "Peace" "Eternal LIfe"